So we recently had a beautiful butterfly bash here for my daughter's 7th birthday. She picked the theme of butterflies and we ran with it. One of the cute ideas I found (I actually ended up using in three different ways at the same party), was this adorable free butterfly cut out I found over at Martha Stewart's website. I thought I'd show you how I put them to good use. 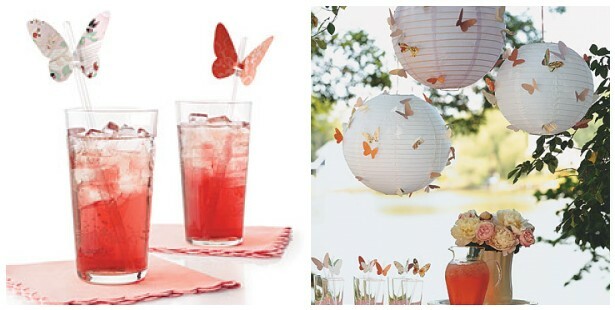 Bright and beautiful butterflies add a sweet touch to your birthday, baby, or bridal shower. How cute and lovely are these? I thought using them on the straws for the glasses would be perfect for this party. I simply used some pretty left over scraps of card stock I had in different designs and patterns, and traced many a butterfly while I was watching TV, a few nights in a row. Soon I had amassed a large pile of the pretty bugs in many shades. One thing I thrive on by the way, is being thrifty. If I can plan ahead and make some of the decorations myself in an inexpensive way, I really pride myself on that. You can still throw a beautiful party on a budget. I had purchased some pink and purple paper favor bags at the Dollar Tree (10 bags for $1) and had this idea to slightly bend the butterfly (so it would look three dimensional) and hot glued it to the top 1/3 of the bag. This made it look like the butterfly had landed right on the bag. This made for a very cute effect! Matter of fact I thought it would be perfect when the kids came, they could pick the color of butterfly they wanted and I would write their name on that. This is how they looked before everyone arrived sitting on the fireplace mantle. Here's a close up. I love how they look like they could flit away at any second. The next way I was going to use these little guys was on the straws. Originally the tutorial had suggested cutting two slits in the middle of the butterfly and slipping it over the straws. I had a slight issue with this, in the fact that it had a big chance of not staying up very well, especially if a kid was going to be handling it. I thought oh, I'm going to have to glue dot, or tape each one of these to make sure they stay put. Since my hot glue gun was all fired up still from the favor bags, I wondered if I could use a very small amount on the straws to stick the butterflies on. Would it melt it and make a hole I wondered? Hot glue + plastic straw .... will it work? Well I did a test and low and behold, with a very thin stream of hot glue the butterfly instantly stuck on. I had my hubby be the straw tester, hoping and praying no liquid would spill out on his shirt. Well... it worked! I started gluing like a fiend and soon I had a good rhythm going. I had a package of multicolored straws in the hues of green, hot pink, orange, and yellow, which helped add to the "uniqueness" of each butterfly straw. The day of the party I placed them in a few of the cups where drinks would be available, which looked really cute. 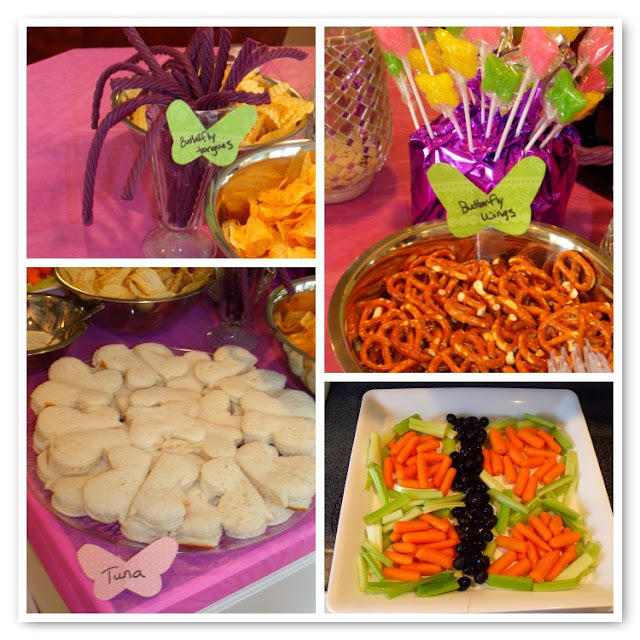 The last way I used the butterfly cutouts (since I had a lot left over) I used them to label food at the party. Just used a sharpie and wrote each food item down so people would know what they were getting. You can't see it, but the butterfly veggies has a label that said "butterfly garden"
So there you have it. One simple template and I used it three ways. I could also totally see these in shades of pink or blue for baby shower, delicate pastels for a bridal shower or summer tea party, a Mother's Day brunch, or even a garden party in the spring. All in all it was these little touches that added greatly to the whole ambiance of our beautiful butterfly birthday party. Love love LOVE these sweet little butterflies! We had many other great ideas for our butterfly party. I will post more soon. Stay tuned.